Summary: The manufacturer’s description and specs, and the average user rating for the Smith & Wesson Custom Engraved Model 60 revolver. This is a new Model 60 Smith & Wesson Revolver chambered in .357 Magnum and .38 Special +P with a 2.125″ barrel. The gun has been lavishly engraved with class B engraving by our master engraver. As you can see by the photographs, the gun also carries a differential finish that highlights the beautiful American style engraving. A letter of authenticity will accompany this gun. 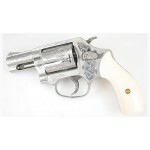 Smith & Wesson’s Custom Engraved Model 60 is a six-round revolver built with stainless steel. It features a rubber grip, a black blade front sight, and a fixed rear sight. This entry was posted in .357 Magnum, .38 Special +P, $2,501-$2,750, Compact, Full size, Revolver, Smith & Wesson on June 22, 2010 by Staff.